So what is a Micro Irrigation System? 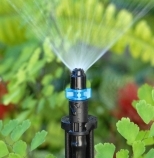 Micro Irrigation systems are small low pressure nozzles placed on riser sakes and positioned amongst the plant foliage at regular intervals as discretely as possible. These risers then connect to a main low pressure supply tube installed within the bed via a small micro tube. 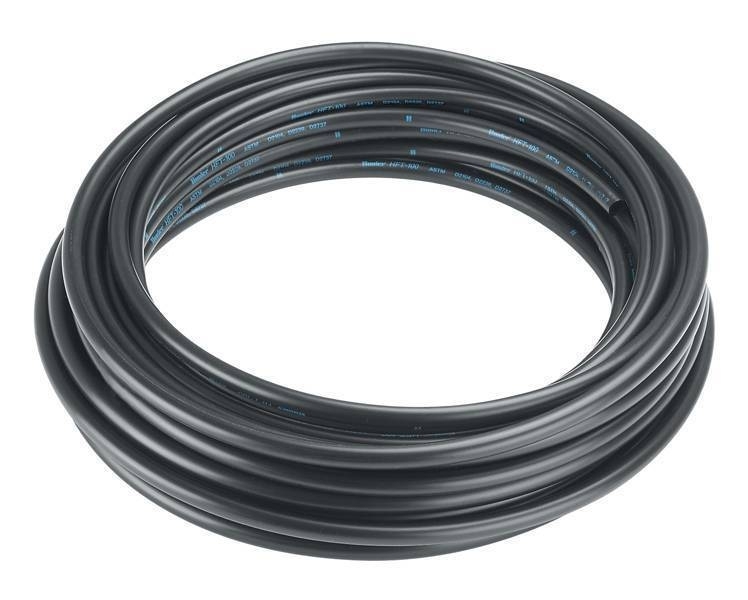 These systems are particularly suitable for water mains pressure connected to a household tap or small pumped irrigation systems. A range of specific nozzles are available to suit particiular be sizes covering between a narrow strip no more than 0.5m wide, through nozzles to suit the largest of areas and plant types. Various spray patterns can also be provided with nozzles that throw just a half or a quarter circle, or fitted with an individual valve for fine tuning of the radius of throw. Due to the low pressure and requirement of these nozzles, it is possible to operate these from a domestic water supply. 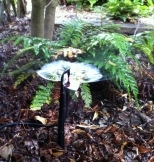 Simply connect to a tap including a battery operated irrigation timer and you can have a very reasonably priced and simple fully automatic watering system. 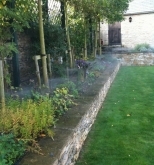 At buyirrigation.co.uk we have tried to make it simple to purchase Micro Irrigation equipment whilst ensuring that you have everything you need to sucessfully water your garden. 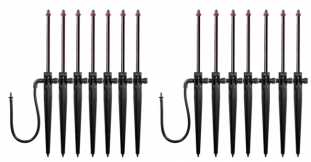 The Micro watering kits include the ever popular Vari-Jet spike which comes complete with regulation valve and connection to the main feed pipe. 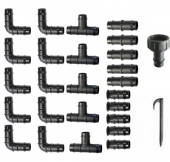 To assemble, you simply punch a hole in the main feed pipe with the spike of the sprinkler and then insert the small micro pipe adapter into the hole which locks in place. Our MICRO2 Kit offers the ability to water an area up to 100 sq m via a dual output water timer connected to your tap. The dual output timer gives you individual programming of each of the areas. The kit will include double he quantities of all the materials shown above with the single output timer substituted for the dual model shown below. All the products above can be purchased seperately together with a vast range of nozzle combinations to suit all applications. Call Us for further details and advice.